Synthetic peptide corresponding to Mouse Dnmt3b aa 1-100 (N terminal) conjugated to keyhole limpet haemocyanin. WB: CHO, HUES7, F9, mouse embryonic germ cell and E14Tg2a whole cell lysate. Lysate prepared from human NCCIT cell chromatin fraction. Our Abpromise guarantee covers the use of ab16049 in the following tested applications. WB Use a concentration of 0.8 - 1 µg/ml. Detects a band of approximately 110 kDa (predicted molecular weight: 100 kDa). Abcam recommends using milk as the blocking agent (3-5%). Please contact Scientific Support for more information. Formalin-fixed, paraffin-embedded pig lung tissue stained for Dnmt3b with ab16049 at a 1/100 dilution (red) in immunohistochemical analysis. 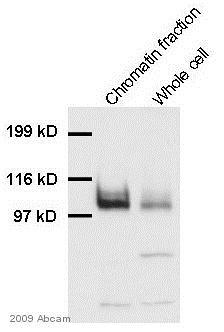 Cy3 conjugated donkey anti-rabbit secondary antibody. Lysates/proteins at 200000 cells per lane. 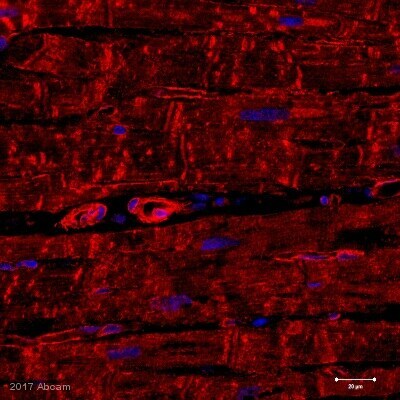 10% formallin-fixed human heart tissue stained for Dnmt3b (red) using ab16049 at 1/1000 dilution in immunohistochemical analysis. 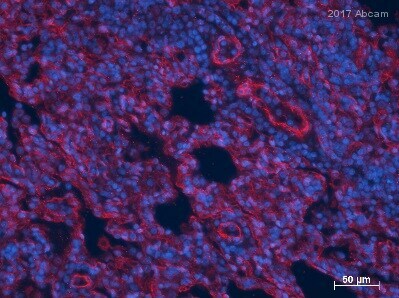 10% formallin-fixed mouse kidney tissue stained for Dnmt3b (red) using ab16049 at 1/1000 dilution in immunohistochemical analysis. 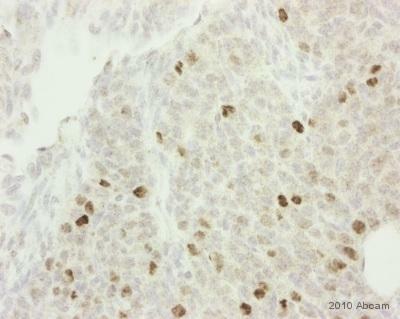 Formaldehyde-fixed mouse testis tissue stained for Dnmt3b using ab16049 at 1/5000 dilution in immunohistochemical analysis. 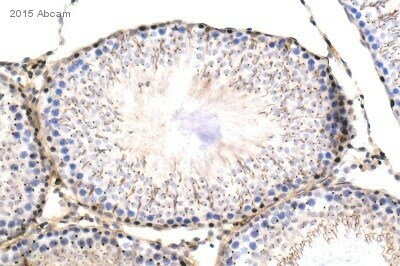 Formaldehyde-fixed rat testis tissue stained for Dnmt3b using ab16049 at 1/6000 dilution in immunohistochemical analysis. 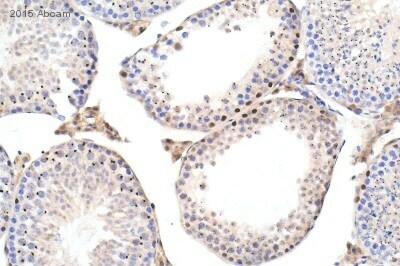 Formaldehyde-fixed mouse ovary tissue stained for Dnmt3b using ab16049 at 1/2000 dilution in immunohistochemical analysis.